Beautifully engraved SCARCE SPECIMEN certificate from the Loomis Corporation. This historic document was printed by the American Banknote Company and has an ornate border around it with a vignette of the company logo that reads "Safety Dwith dispatch". 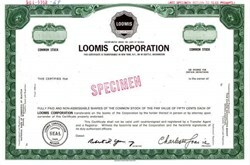 This item has the printed signatures of the Company’s President ( Charles Loomis ) and Secretary. This is the first time we have had this certificate for sale.